The last time I asked, the price of tomato is outrageous; it is like 500% higher than what it used to be 3 months ago. Here is an unofficial explanation for the price hike. It is not only tomatoes that is affected by this blight, virtually every item is now 2-3X what it used to be as the impact of inflation and weakened Naira catch up with the ailing Nigeria economy. 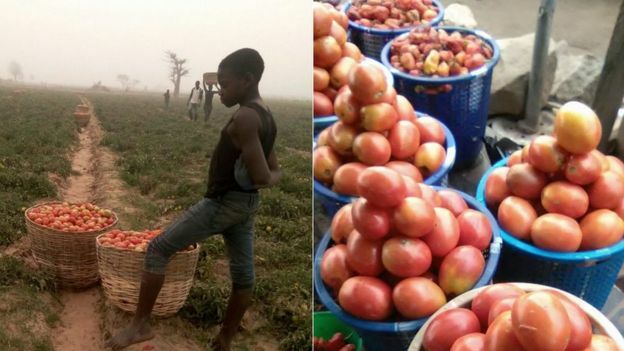 (Image source): (R): Tomatoes used to be sold between 400 Naira and 500 Naira (~$2) a basket in March. (L). Smaller baskets in Abuja selling for 5,000 Naira recently. As a result of this economic downturn, i expect consumers to practice Buhari-nomics, which I defined as abstaining from spending on some services considered luxury or flambouyant as they cut their expenses. Why I was reflecting on the expected changes in what people buy, i asked a soul searching question, “What if your services fit into the description of what people want to refrain from patronizing as a result of the economic downturn?” To put this in perspective, see how it has affected ecommerce sites in Nigeria. 2. Emotional or rational justification. i.e. they spend on what they consider needful because they need to justify their spending. The truth is that you can’t force people to spend their hard earned money with you, but you can appeal to their emotional triggers (point 2) and still make them buy even in this current economic scarcity. So, if you are concerned about having less sales than before, here are 5 strategies you can use to bump up your revenue. 1. Invest in strategic content creation that leads to sales. To get people to buy, you need to develop a content strategy that offers immense value before you ask for a sale. When your content offers immense value, your prospects obeys the law of social reciprocity and feels compelled to buy from you. That sense of “owing you” is what they need to justify their purchasing decision. This can also apply to subscription services where there might be expected user churn. You can use content strategy to convince them that your service is worth keeping by providing use cases, testimonials, white papers and industry insights in addition to the core service that you offer. Apart from text, there are other forms of content like video, private virtual workshops, and live events that you can invest in. Two of my favourite SaaS platforms offer occasional webinar with the founders to incentivize upgrading your membership or keeping your subscription active. This will move your product away from being a commodity to a community where people will invest their emotions. People always love sales and discount. It gives the perception that they are getting more for less; and that is what they want, especially now. You can use third party sites like DealDey to promote deals. This might not be as effective to drive profit, but it can give you some quick sales. Moreover, if you know how to build upsells into your sales or can turn deals seeker to repeat buyers, the better for your revenue. You can also set this up yourself, for example, I often receive special 1-day deals and freebies from a Nigerian SMS retailer who do not limit their giveways to seasonal discounts; they simply find the “dumbest” reasons to give bonuses which are available for a limited time, just like Jumia that recently had a Mobile Week which lasted for a week. 3. Positioning 101: Make your product looks like it is either saving people money or making them more. Many business have a poor statement of value (SOV). Your SOV answers the questions, “what is in it for me?” that the customer might be asking. In simple term, it means that instead of talking about the features, show the benefits of your products to the user. Hence, you need to redesign your website with a focus on your customer pain points. Instead of simply stating the features of your product, you should turn it to a benefit-driven headline that addresses the pain point of your customer. The table below shows examples of how you can turn your product features into benefit statements. Another positioning strategy is to narrow down your audience as advised by Conversion Scientist. This appears counterintuitive, but even irokoTV had to do it in the wake of competition from NetFlix. While you might need to scale down on spending on adverts, you should never stop completely. Rather, ensure you have a better messaging with a strong call to action. You can consider using this Facebook Ad guide to get cheap Facebook targeting. Most likely, your competition have stopped advertising and your ads will be the only ones your potential customers will see. Visit Konga or Jumia, check out some items but do not buy yet. Then visit Facebook or any other site; you will notice that the adverts of the product your just checked will be following your around the web. That is what is called retargeting and it can increase your revenue between 300% to 700%. You can see some other case studies here. 5. Discount Loyalty and Subscription Models. With discount loyalty model, You can get people to pay in advance for services they are yet to use. One of Nigeria’s Airlines Aero, used to discount future travels (with conditions attached) . This gives them a pool of fund from the post dated services they are yet to offer. Another example is Amazon, Amazon locks in customers with the AmazonPrime programme and acccording to Times, this essentially welcomes online shoppers into the Amazon “consumer sphere” and results in sharply increased spending at the site; because, in a bid to maximize their $99 subscription, AmazonPrime subscribers ends up buying more to justify their subscription. Choosing not to play like Jumia and Konga, Supermart.NG and Gloo.NG replicated a similar model in Nigeria. If you are not sold on the idea yet, Segun Adeyemi , CEO of Amplify; a local payment gateway focused on recurring payment wrote an interesting piece on how you can restructure your current business for the subscription model. I chanced to meet his co-founder, Maxwell Obi in MEST, Ghana, just before the relaunch. Newspapers, TV and blogs all want to get the latest news. You can take advantage of that to get your business in the news by sharing how your product or services is a solution to the economic challenges or how your customers are using your products to save money etc. I shared the strategies I use and wrote a followup post here. Note that whatever claims you make, ensure that it can be verified and not misleading. Based on track records, using this strategy is more effective than paying for banner ads or jingles. Repeat sales can be the difference between a thriving business and a failing one. Repeat customers are profitable. There are several stats to prove this. You can increase repeat visit by improving your post-sale customer experience. Amazon, the world’s biggest retailers are effective in improve repeat visit to their website. to do this, they have an email strategy and other strategies you can take some tips from. More landing pages means more conversion opportunities. Statistics from Hubspot has proven that the more landing pages you have on your website, the more opportunities you have to convert site visitors into leads. You should design each landing page to address specific customer segments. The Pepsi brand launched the #longthroat global campaign on twitter which I learnt cost an arm and a leg. For savvy small businesses there is a way around it to get your message out. The quote I referenced is an interesting piece about a man who sowed during a season of famine in Gerar (modern-day, south central Israel) around 2500 B.C.The story ended with the man harvesting a 100% despite drought. By applying some of the tips, the Isaac strategy can work for your business. Good luck.